The Christmas season is almost over; the Feast of Our Lord's Baptism will bring the season to a close. Here's a project to keep those smells of the season alive in our memory, and in our house. The Gingerbread bowls are easy to make, no matching of walls, no royal icing to use as glue, no extra candies or cookies to find to decorate. But once made, they are an attractive addition to your table or kitchen, and can stay around even after the Christmas decorations are put away. While working on the bowls, serve up some mulled cider. Fill these attractive bowls with assorted Christmas cookies; they make charming gifts. A narrow red grosgrain ribbon could be threaded star to star in the border, tied with a bow, and decorated with a bit of greens. 1. In a large mixer bowl, cream the butter and sugars until fluffy, about 1 minute. With the mixer running, add the molasses, corn syrup, vanilla, and eggs, one at a time, beating until the mixture is well combined. In another large bowl, combine the remaining ingredients with a whisk. 2. Add the flour mixture gradually to the creamed mixture (the dough will be very stiff and you may have to use your hands to get all the flour worked in). Divide the dough into quarters and wrap each in plastic wrap. Chill overnight. 3. Cover the outside of a 1 1/2 quart ovenproof glass bowl with a lipped edge with aluminum foil, bringing the foil over the edges to the inside. Make sure the foil is on very smoothly. Spray the entire bowl with vegetable cooking spray and set aside. 4. On a floured surface, roll one-fourth of the dough into a circle 1/4 inch thick. Immediately life the dough and press it onto the outside of the bowl, molding it firmly to the shape of the bowl without stretching it. Trim the dough around the edge of the bowl with a sharp knife, then, using a small star-shaped cutter, cut out stars around the lipped edge of the bowl about 1 1/2 to 2 inches apart and about 1 1/2 inches up from the bottom of the inverted bowl. Refrigerate the bowl for 1 hour; the firms up the dough and prevents slippage during baking. 5. Preheat the oven to 350º F. Place the inverted bowl on an ungreased baking sheet and bake 20 to 30 minutes, or until lightly browned and firm to the touch. Allow the gingerbread to cool on the bowl. When cool, carefully loosen the foil and lift the foil and gingerbread shell off the bowl. Peel away the foil and discard; store the shell, uncovered, in a dry place away from the humidity of the kitchen. 6. 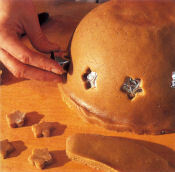 Use the remaining dough to make 3 more bowls, or cut with decorative Christmas cutters into cookies. Bake the cookies on a lightly greased baking sheet for 8 to 10 minutes, or until they are lightly browned.